ganK the Synthesizer, Other Virtual Synth from Lucas Xie. 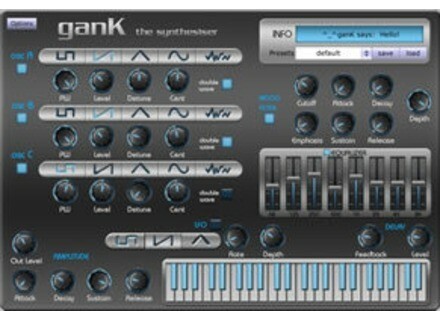 Lucas Xie has announced the release of ganK the Synthesizer, a free additive/subtractive synthesizer. 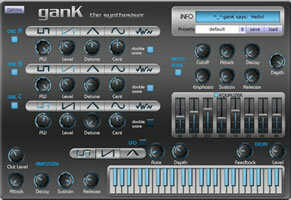 ganK the Synthesizer is a free and is available for Windows as a VST instrument plug-in and a stand-alone application. Bolder Sounds Handbells for Kontakt Bolder Sounds has announced the release of its new Handbells sample library, featuring a 3 octave set of handbells recorded in 9 articulations totaling 1.2 gigabytes. Novation Launchpad Available Novation has announced that Launchpad, the interactive controller for Ableton Live, is now shipping and available in stores and online.